Just a few short years ago the general perception of residential car lifts were that they were fantastic devices owned by fictional characters such as Batman and James Bond. In reality both residential and commercial vehicle lifts have been with us for quite some time. Infamously Mitt Romney changed all that in 2012 and threw a spotlight on vehicle lifts when during the American presidential election of 2012 it emerged that he had ordered a car lift for his southern California home. 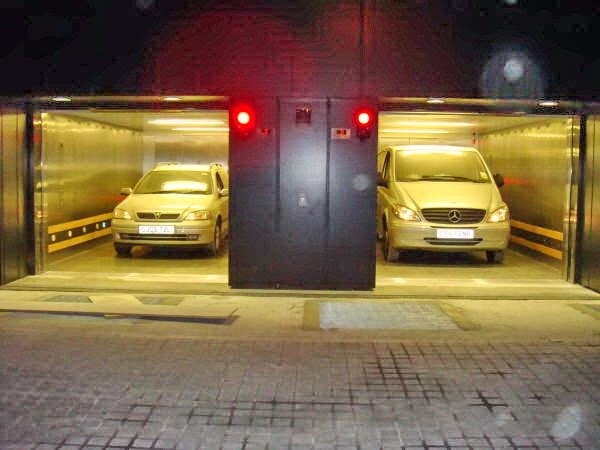 Car lifts are a smart solution for businesses or individuals that need vertical transportation for vehicles. Do you know what should you consider when choosing a car lift? We have listed 5 pointers below. It seems obvious but it is important to know the exact dimensions and weight of the vehicles being transported. Any lift chosen will need to have the appropriate load capacity. Similarly the exact dimensions of the lift car will need checked and double –checked: lifting capacity, height and width. Will this lift fit within the property? Does it meet the compulsory legislative requirements of The Lifts Directive, designed in accordance with the EN81/1or EN81/2 standards? Can the vehicle car door be opened? 3. What features are needed for the car lift? There are a lot of permutations for your car lift; Which power system and door arrangement for should you choose? Do you need all or some of the following: traffic lights at entrance levels, Remote 'key-fob' controls, 'Strip' switch controls to side walls? An oil heater for cold morning starts, Oil cooler allowing increased use, Faster speeds for long travel heights, ventilation for the car and shaft? However, not all car lifts need to be Hydraulically operated. There are lots of car lift manufacturers in the marketplace with a wide variety of prices. You will need to do your due diligence before selecting a supplier and without specialist knowledge it can be difficult to properly assess the merits of one supplier against another. What is the full extent of the warranty being provided by the manufacturer? How will the car lift be maintained? These are both essential questions to be answered prior to committing to a car lift solution. You must also consider how often the car lift should be assessed for wear and tear. It is essential that all owners area aware that 6 monthly LOLER inspections being a mandatory requirement. Dunbar and Boardman is the lift, escalator and access equipment consultancy. We have extensive experience of projects including car lifts and can help you make the right choice. For one car lift project we made the vertical parting door system automatic and avoided the need for constant pressure controls. This improved the use of the lift. One current project requires delivery lorries and refuse trucks to be taken from the street to an underground loading bay. Do you have a current or planned project that includes car lifts? We would be happy to discuss any such requirements and how we may be able to assist. Give us a call on T +44 (0) 20 7739 5093 or send us an email via peterboardman@dunbarboardman.com to start the conversation. We look forward to hearing from you.